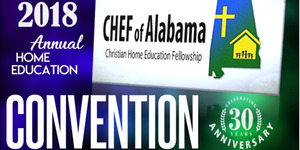 Many thanks for your past support of Christian Home Education Fellowship (CHEF) of Alabama! We ask for your continued support in publicizing our 30th annual convention, coming June 22-23, 2018 at Oak Mountain Presbyterian Church in Birmingham. We've lined up some exciting speakers this year. Steve and Megan Scheibner are homeschooling parents of 8 children who speak about parenting, marriage, and God's providential intervention in their lives. Steve was supposed to be a pilot on one of the 9/11 planes but was bumped the night before by a more senior pilot. Bob and Debby Sjogren with Cat N Dog Theology, popular vendors the past two years, seek to call Christians from self-centeredness to focus on the glory of God. A simple joke relates that “Dogs have Masters; Cats have Staff.” Cats may call you Master, but tend to live a self-centered life, where you are there to serve and take care of them. Dogs, on the other hand, are eager to see and please their master. Popular author Chuck Black (Wars of the Realm, The Kingdom Series, and The Knights of Arrethtrae) will speak to teens and adults. Teens will also hear from Will and Heather Potter, homeschooling parents and owners of Birmingham Academy of Martial Arts. Margie Marsh from Cat N Dog Theology will lead the children's program. Of course, we'll have a packed vendor hall and a used book sale! Early bird registration discount ends April 30, 2018. Help us make CHEF’s upcoming 30th anniversary convention a memorable one! Encourage your families to attend. Come expectantly and purposefully, to see old friends and make new ones, asking God to inspire you in your homeschool journey.